Do you love teaching math? Whether you're a student teacher, a current teacher, a retired teacher, or a non-teacher who just loves sharing math, MVGATE wants to put your skills to work for the community. 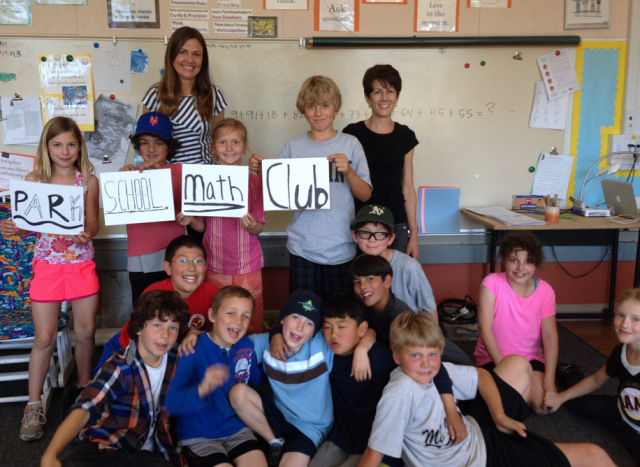 For the past few years MVGATE, Marin's nationally-recognized nonprofit PTO for advanced learners, has offered an after-school Math Olympiad Team at a few schools. This year we want to expand the program to more Marin schools, to give bright, curious kids in grades 4-5 the opportunity to spread their wings and sharpen their minds. The hours are flexible: work as many days/week as you like, from one to five days/week. Math Team meets for one hour right after school. Each meeting takes 90-120 mins of work. The pay is good: depending on your experience and class size, we pay from $60 to $100 each meeting. You might bring in $500/week for a fun, part-time job. The curriculum is strong: as our foundation we start with the international Mathematical Olympiads for Elementary and Middle School program (MOEMS), now entering its 40th year and enjoyed by 170,000 students from 6,000 teams in all 50 states and 30 countries. Here's a sample (pdf) of MOEMS competition problems. That's just the start; then your creativity and experience enter the mix, extending this MOEMS foundation to create a unique learning experience for the kids! At public schools in Mill Valley, Larkspur Corte Madera, suburban San Rafael (Dixie school district), and Novato. ​Experience the thrill of sharing math and logic with bright young minds who actually want to learn!